BETHEL — Lindsay Harnden had never competed in Maine’s Fat Bike Winter Series before this winter. And Sarah Reynolds had never won a bike race before last weekend. Yet last Saturday, as the two women stood in sleek, ski-racing-type outfits at the Bethel Snowmaggeddon Fat Bike Race, they each celebrated a fat-bike first. Harnden, competing for the first time in the five-race series, captured the Bethel short-course race in the women’s division and Reynolds won her first bike race ever – coming in first in the long-course race in the women’s division. • Titcomb Mountain Fat Tire Race: 6:30 p.m., Feb. 16, Farmington. (This race will be held under lights. “I’m shocked I won, and super pumped,” said Reynolds, a Farmington resident. She turned 40 in August and isn’t letting that stop her: She plans to run half-Ironman triathlon race this year. The day of the race, held on Bethel Village Trails against the backdrop of the majestic White Mountains, felt like a celebration of first-timers in this fast-growing sport. 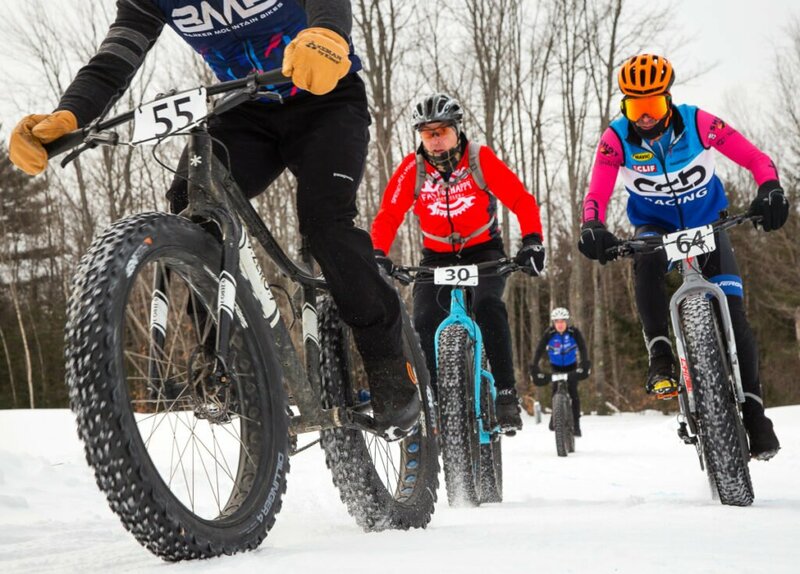 The Bethel race was part of the Maine Fat Bike Winter Series for the first time. And many who competed, like Steve Lamontagne of Auburn – who won the men’s short-course race in just over an hour – were racing a fat bike for the first time. (Riders don’t need to qualify to participate in the series). Fat bikes are mountain bikes with super-sized tires that are designed for riding in the snow and sand. As enthusiasm for the bikes has spread across the country – the World Championships Fat Bike Race in Crested Butte, Colorado, is now in its fourth year – the Maine series is growing in lockstep; it added two races this year to extend a five-race series further around the state. The first winter race in Maine was held just three years ago, in Rangeley in 2016. The Maine Fat Bike Series was created the following year with races in Bangor, Rangeley and Farmington. This year, races that already were being held in Bethel and Carrabassett Valley were added. The season opened Jan. 27 and the last race will be held March 3 in Bangor. The Bethel race drew 54 riders last year. Last weekend the number shot up to 89. Riders raced the short 8.6 miles course or the long course, which covered 17.2 miles. Men and women competed at the same time on the same 4.3-mile loop, circling two or four times depending on their event. The race drew riders from 12 to 60. Most were men, which is typical of the demographics of fat bike races, officials said. At 7 a.m. on race day at the trails – Nordic ski trails that were specially groomed for the fat bikes – the temperature was 6 degrees. By the time the race started, it had warmed to 13 degrees. But the riders, dressed in Nordic-ski-type tights and biking jackets, took the cold in stride: a few rode around before the start to stay warm. Some stowed hand and feet warmers under their gloves and winter bike boots. Others wore ski goggles over their bike helmets for added protection against the wind. All the riders headed out at once, smiling as they cycled into the woods on snow so soft it required peddling hard to move at all, let alone move fast. When snow is hard, fat bike riders can travel as fast as mountain bike racers do on dirt– speeds up to 10 mph. But riding on soft snow can be a slog. The trails circle the Bethel Inn Golf Course, then dart into the woods where they run over winding hills and along a stream. Collin Johannen of Chelmsford, Mass., smiles as he rides up the last stretch before the finish line in Bethel. The first winter race in Maine was held three years ago in Rangeley. Now there’s a five-race series in the state this season. Riders say racing is a good way to stay fit in winter. Relatively speaking the sport isn’t expensive, they say. Bikes run between $1,000 and $3,000. The gear may cost a few hundred dollars more, and many of the fat bike trails may be used for free. But after she won her first fat bike race in 2017, then another last year, she decided to race the entire series this winter. So far she’s competed in two short-course races and has won them both.